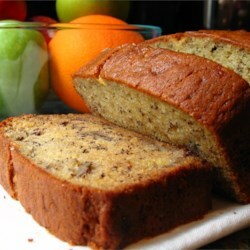 This is quite simply the best banana bread I've ever had. I followed the recipe as stated, with a few additions, to enhance the overall flavor of the bread. I added 1/4 tsp cinnamon and 1/8 tsp ground cloves to the batter and 1/2- 3/4 cup semisweet chocolate chips in addition to the walnuts. Almost all the reviewers agree that the bananas should be mashed, so I mashed them. This distributed the banana flavor evenly throughout the dough. I also advise against using a mixer for the batter. This would whip too much air into the cake and take away from its dense quality. I baked the bread at 325 and it was perfectly done in an hour and 15 minutes. It cuts easily, thinly and has a great crust. Thank you for a great recipe!